Two astronauts who helped capture and berth the Dragon supply ship said Saturday they would be comfortable flying a human-rated version of the craft on commercial flights to the International Space Station. NASA flight engineer Don Pettit guided the space station's Canadian robotic arm to grapple the private cargo freighter Friday, three days after it blasted off from Florida on a test flight long-awaited by NASA and SpaceX, the craft's builder, owner and operator. Joe Acaba, a former school teacher and environmental scientist, helped configure the space station's berthing system to receive the Dragon spacecraft as Pettit moved the capsule in position with the robot arm. 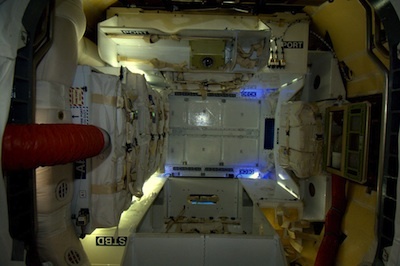 The research outpost's crew opened the hatch to Dragon on Saturday, and Pettit, Acaba and Andre Kuipers, a European Space Agency astronaut, spoke with reporters from inside the ship's cabin a few hours later. "I spent quite a bit of time poking around in here this morning just looking at the engineering and the layout, and I'm very pleased," Pettit said Saturday. "It looks like it carries about as much cargo as I could put in my pickup truck." 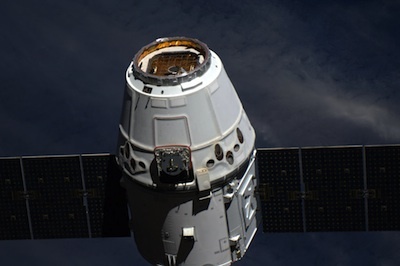 Dragon became the first commercial vehicle to visit the space station when it arrived Friday. The craft is on a NASA-sponsored test flight to demonstrate transportation of cargo to the space station and back to Earth. Dragon's cone-shaped pressurized compartment measures 12 feet in diameter at its base with a height of 14.4 feet. It has a volume of 350 cubic feet, about the size of a large walk-in closet. SpaceX plans to outfit the Dragon spacecraft with seats, cockpit displays, controls, and an abort system to launch and land with up to seven astronauts. The company is competing for funding from NASA's commercial crew program, which intends to award at least two private firms in August with government financing to help cover the design and testing of rockets and spacecraft for astronaut transportation to and from the space station. Until a commercial craft is certified for astronaut crews, U.S. fliers must ride to the station on Russian Soyuz capsules. 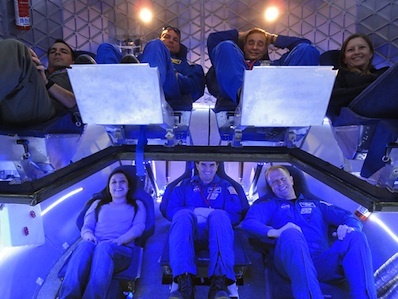 NASA expects a commercial crew craft to be ready for operational missions by 2017. Pettit, who launched to the station on a Soyuz in December, said Dragon is bigger than Russia's venerable capsule. "It's roomier than a Soyuz, so flying up in a human-rated Dragon is not going to be an issue," Pettit said. SpaceX developed the Dragon and its Falcon 9 booster with a mix of public and private investment. SpaceX has spent $1.2 billion since its founding in 2002, including development of Falcon 9, Dragon and other projects. About $680 million has been spent on SpaceX's space station cargo development efforts, according to Gwynne Shotwell, SpaceX's president. "I have a lot of confidence in our future, and this is a great first step to move us forward with the commercialization of [spaceflight]," Acaba said. "I think we would feel very comfortable in a human-rated vehicle just like this one." NASA has ongoing funded Space Act Agreements with SpaceX, Boeing Co., Sierra Nevada Corp., and Blue Origin. Each company is designing crewed spacecraft capable of reaching the space station. Andre Kuipers, who hails from the Netherlands, called Dragon "beautiful, spacious [and] modern" on his Flickr photo page. With blue interior lighting, Kuipers said Dragon "feels a bit like a sci-fi film set." Pettit said Dragon was plenty spacious for quick trips to the complex, which orbits 250 miles above Earth. It would take between just a few hours to a couple of days for astronauts to arrive at the space station after launch. "There's not enough room in here to hold a barn dance, but for transportation for crew up and down through Earth's atmosphere and into space, which is a rather short period of time, there's plenty of room in here for the envisioned crews," Pettit said.